Our comprehensive range of tree pruning equipment is ideal for clearing tree debris near overhead power lines. Pruning Saw Heads- The branch cutting saws are suitable for fitting to either standard intermediate pole sections with oval joint button, or standard spigot type top section poles. The curved 6-tpi blade facilitates a cutting action on both forward and backward strokes, which greatly reduces the effort required when compared to the conventional saw blade. The blade is 14″(355mm) long and manufactured from stainless steel and is lacquered to ensure a long service life. When used upon an intermediate section pole, the blade is bonded and riveted into an insulated pole head to provide sure location during use. Alternatively, when used with a standard top section pole the blade is securely bolted into a lightweight aluminum pole head. The blade is profiled at either end, to prevent the branch from slipping from the blade whilst cutting action is taking place. Tree Pruning Head- C/W Nylon Operating Cord (EFS-18325): comprising a high quality steel side action cutting blade, offering a long life of the cutting edge. 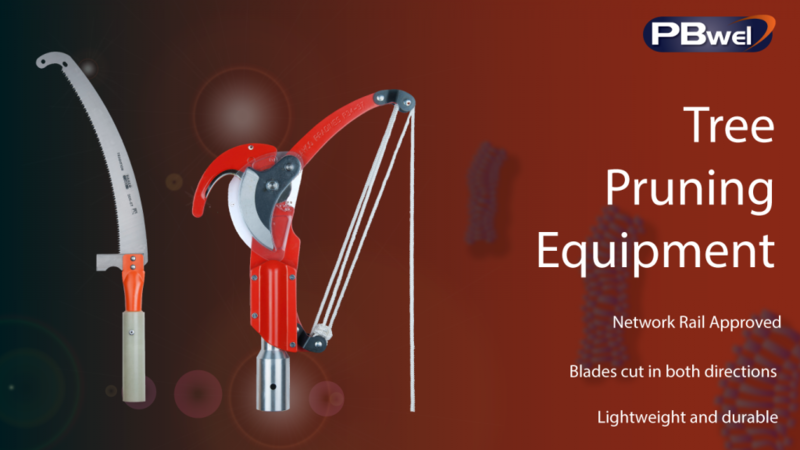 This tree pruning equipment is suitable for fitting upon a standard spigot type top section operating pole, by use of an aluminum adaptor for rigid location when cutting. The spring-loaded side action cutting blade is able to cut branches up to 1.75″ (44mm) diameter. Operation is facilitated by a nylon operating cord, which is fitted to the blade operating lever, for ease of use from ground level.